The Society for Personalized Nano-Medicine’s 5th Annual Personalized Nano-Medicine Symposium brought 130 of the top basic, translational and clinical researchers from around the nation to FIU on Nov. 1, including a surprise guest, Dr. Robert Sackstein, who will take the reins as the new dean of FIU’s Herbert Wertheim College of Medicine in January. Sackstein stopped by to briefly welcome the distinguished guests to the symposium along with Dr. John A. Rock, the College of Medicine’s founding dean who is stepping down after 11 years. 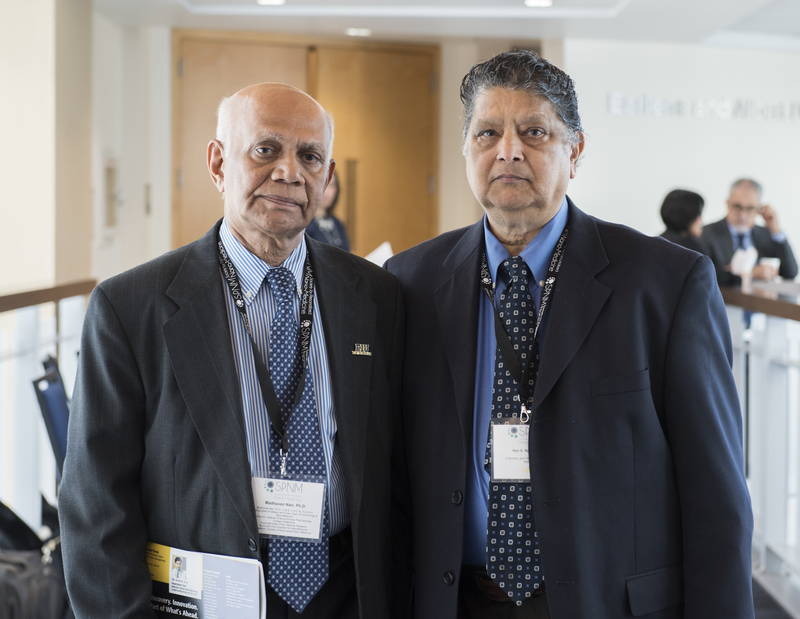 The meeting was founded in 2013 by Madhavan Nair, distinguished professor and chair of the Department of Immunology and Nano-Medicine and director of the Institute of NeuroImmune Pharmacology. With more than 45 presentations ranging from regenerative nano-medicine based on rare earth particles to personalized biofabrication of tissue, the annual symposium has become an important meeting for the country’s top nanotechnology researchers to learn about the novel research being undertaken by their peers. 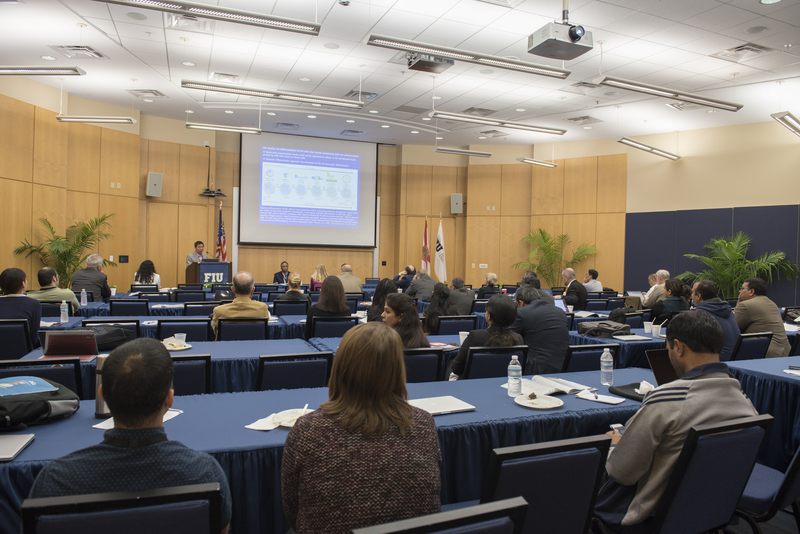 FIU’s investigators shared their work on the development of unique nano-formulations targeting HIV reservoirs in the brain; the use of multifunctional nano-therapeutics for the treatment of opioid addictions; the molecular dynamic docking studies for treating neurocognition impairments; and other research. “Our Department is heavily focused on finding nano-based solutions for a host of challenging conditions and diseases — including substance abuse, Alzheimer’s, HIV/AIDS and Zika,” said Nair. And there has already been progress, Rapaka points out. “People aren’t dying of heroin overdoses because of Narcan.” Narcan, or naloxone, works by blocking or reversing the effects of opioids. Available as an injection or nasal spray, nanotechnology enabled researchers to increase the amount of active medicine in the formulation, which has been critical in reversing overdoses. But there are escalating threats from new synthetic opioids and heroin imported from other countries, including an extremely dangerous drug from Thailand called Kratom which experts warn will require even a stronger Narcan or equivalent to have any impact. Studies supported by NIDA presented at the conference include targeting molecules that can form a base for non-habit forming anti-chronic pain therapeutics; identifying and creating analogues of hormones that have been shown to decrease the preference for morphine and the development of safer, non-habit forming opioid analgesics for chronic treatment, among others.